As a lecturer, sponsor of highly regarded design awards, juror and design expert, he is more in demand today than ever before – right across the industry with roles, for example, at Mercedes, EADS and Stihl. Professor Rido Busse was the initiator of Plagiarius and the Plagiarius e. V. campaign and for many years now he has been campaigning, with the presentation of this negative award, against product plagiarism. 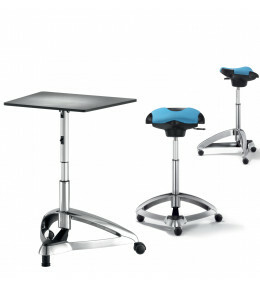 Dolphin Standing Seat is a sit-stand leaning stool. Ideal for professionals like dentists and surgeons or factory workers.